Heading in to a new year is like starting a new exercise book. A fresh start, with no mistakes. Many of us start, 1st January, with our list of new year’s resolutions, then just like writing on a crisp, white, clean page, using our best handwriting, we try and live out our lives with perfection and precision. The truth is, many give up on these resolutions after a week or 2 once disappointment sets in after failing to live up to their ideal lifestyle choices. 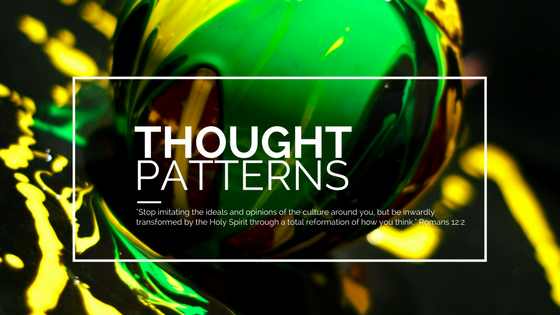 Instead of creating new year’s resolutions, perhaps we need to create new thought patterns instead. They say it takes 40 days to change a habit or create a new one. One year during Lent I decided to give up sugar in my tea and coffee. I managed to get down to half a spoon but I could never enjoy a drink without a little bit of sweetness. For the majority of the 40 days I didn’t enjoy one sugarless drink but I was determined to keep fasting sugar. By day 40 I was surprised to find it no longer bothered me, and what shocked me even more was when sugar was accidentally added to my tea or coffee, it was way too sweet. This is a simple illustration, but it’s the same for any habit or thought pattern. It takes time, persistence and determination. Instead of making new year’s resolutions this year, can I challenge you to decide to change a thought pattern or habit for the next 40 days and watch for the difference it’ll make to your life. Do you have a habit of complaining, worrying or thinking the worst? Perhaps you look in the mirror and don’t like what you see or assume others think the same? Choose to change those thought patterns this year. Choose to speak faith in the face of worry. Choose to speak truth in the face of deception. Choose to speak positively in the face of negativity. Choose to speak love in the face of hatred. Choose to transform your thought patterns using the word of God and I guarantee you will start to see a significant change in your life. If you have ever felt weak, insecure, inadequate, guilty or lonely – this book is for you! Discovering what your hopes, dreams and visions are is easy, but living them and fulfilling them throughout your life-time is actually much harder? Skills, talents and dreams get you so far, but every life needs grit, determination, endurance and flexibility to truly make it! It is with this in mind that Jarrod Cooper wrote the book “STRONGER: Building a Powerful Interior World,” and published an online course that goes with it. Now he has joined with his wife, Victoria and well-known speaker and leader Marion Cooper, to give you this 40-day devotional. Packed with brand new material, “STRONGER: The 40 day Devotional” will take you on a journey building attitudes and beliefs that will release divine wisdom and strength in your life. Each day presents you with a scripture, an inspirational short piece to get you thinking, followed by a prayer, action point or declaration. The Bible says that the weak will say, “I am strong!”– 40 days from now, that will be your testimony, as you put into place divine strategies for growing in God’s might, found in this book. Love this. It’s real wisdom – wisdom I plan to put into action starting today. Thanks Vicky, your blog always brings something positive to my day. And if the new devotional is anywhere near as good as the original ‘Stronger’ book I know I’m going to love that too.